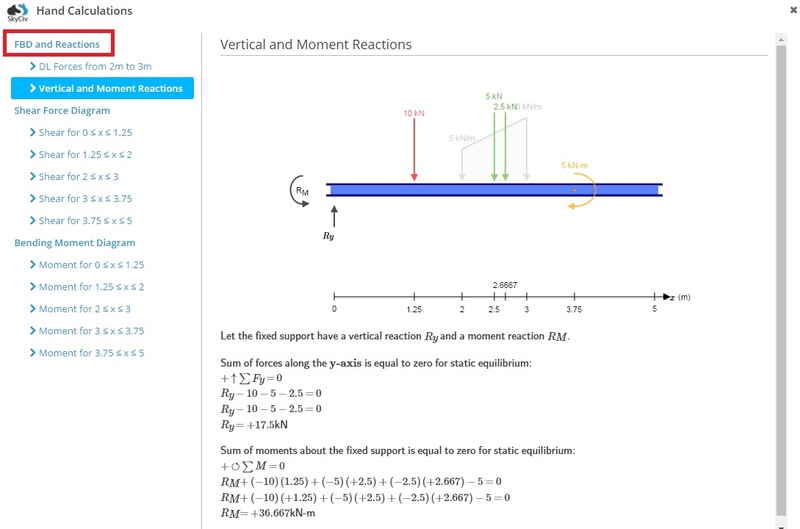 SkyCiv Beam provides full hand calculations for reactions, shear force diagrams (SFD), and bending moment diagrams (BMD). This provides a useful way to validate the results for yourself. 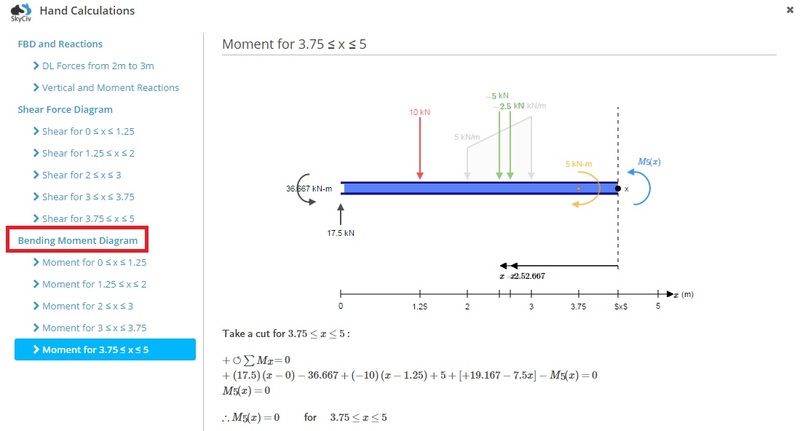 We’re confident that you’ll find this feature useful whether you’re a student learning about the principles of structural engineering, or a professional needing to double check the figures. Hand calculations can be accessed after a model has been solved. Please note that full hand calculations are only available for statically determinant structures. If a structure is statically indeterminate, the hand calculations for reactions will be incomplete. All the hand calculations can be found in the ‘Hand Calculation Wizard’ pop up. 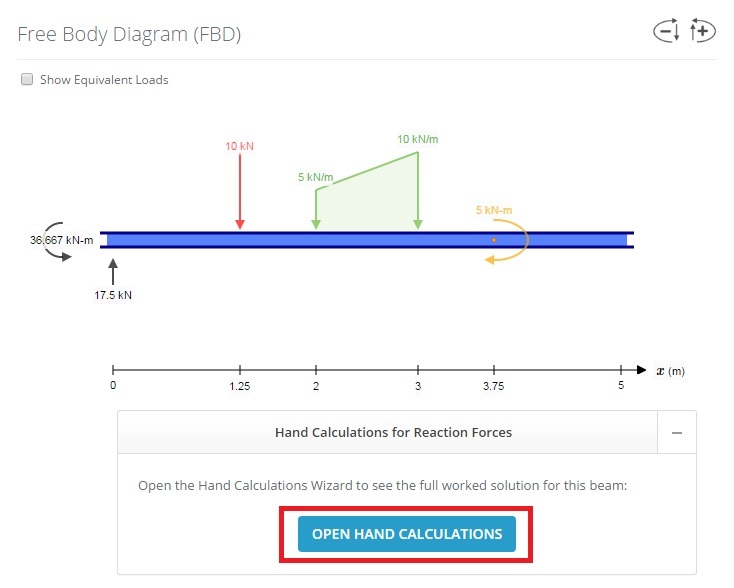 Open this popup by clicking any of the ‘Open Hand Calculations’ buttons found under the FBD, SFD, and BMD results. The FBD and reactions results are found right at the top. The method considers static equilibrium equations. 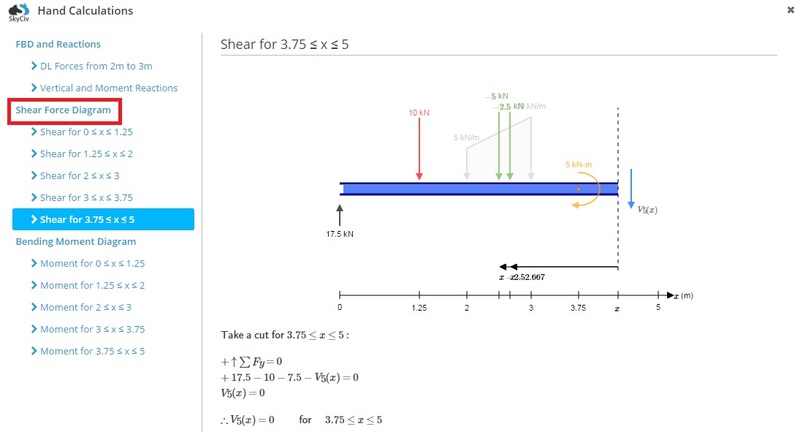 The ‘Method of Sections’ or ‘Method of Cuts’ is used to determine the shear force values at locations along the beam. Similar to the SFD results, the ‘Method of Sections’ or ‘Method of Cuts’ is used to determine the bending moment values at locations along the beam. 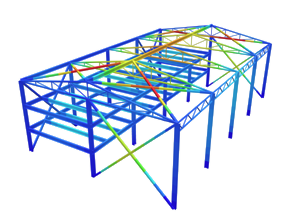 Hand Calculation results are also available in SkyCiv Truss and SkyCiv Section Builder software.